Easy placement on all types of garments, towels, table cloths, and much more. Exact embroidery center marking takes only seconds. 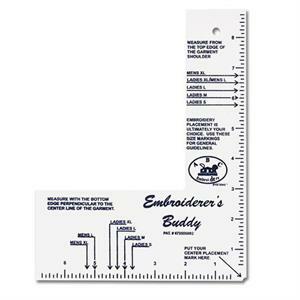 Pre marked industry standard embroidery placement markings give you instant positioning for most people. Choose your own custom markings and get perfect positioning that's right for you. The SNAPPY - Machine Embroidery HOOPING AID from ABC! © 2018 World Weidner. All Rights Reserved.